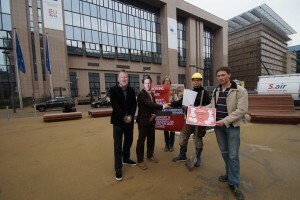 The Stop Mad Mining coalition has handed over your 41,675 signatures that call on the EU to tackle the deadly trade in conflict minerals (see: http://londonminingnetwork.org/conflict-minerals-petition/). The hand-over took place in Brussels, first to Roland Roosdrop from the Dutch Ministry of Foreign Affairs, Presidency of the EU Council, representing the interests of the 28 EU member states in the ongoing EU (trialogue) negotiations. Then they were handed to EU Commissioner of Trade, Cecila Malmström, before engaging in a symbolic petition handover to the Dutch Prime Minister Mark Rütter and MEP Bernd Lange (Social Democrats) at the latest trialogue meeting. Thanks to all of you who supported the petition, especially in the UK our member groups Global Justice Now and War on Want. Brussels – On April 5th EU Parliament and Commission will meet in Brussels with the Dutch Council Presidency for their second trialogue negotiation over a conflict mineral regulation. Before the meeting the Stop Mad Mining network will hand over the petition “Tackling the trade in conflict minerals!” signed by almost 42 thousand people, who demand an EU regulation with mandatory due diligence, which meets the OECD standards as a minimum. Armed groups in high risk areas like the Democratic Republic of Congo (DRC), Colombia and Myanmar are financed by selling the minerals: Gold, tantalum, tin and tungsten (3TG) make their way into phones, laptops and cars that EU citizens buy every day. “It is a shame for Europe to not have any law on that issue, while the deadly trade with minerals continues fuelling conflicts worldwide”, says Anna Backmann from the German NGO Christliche Initiative Romeo (CIR). According to Backmann “the OECD has proposed a methodology for due diligence that was recently implemented by China.” The USA have a comparable law in Section 1502 of the Dodd-Frank Act that focuses on the DRC and neighbouring countries. In their recent field study the US, American NGO ‘Enough Project‘ proved positive effects of the US-law. The ‘Stop Mad Mining’ network argues that this is precisely why a strong, mandatory due diligence regulation is required to ensure all companies importing ores, metals and products containing these materials into Europe check their supply chains. For the handover Stop Mad Mining will be supported by ‘CIDSE‘, based in Brussels, who have just launched their own petition on conflict minerals. In a huge step forward, the European Parliament voted on 20th May 2015 for a strong and binding regulation. It would require companies bringing 3TG products into the EU — in any form — to source them more responsible. The final legislation will be decided in the currently ongoing ‘trialogue meetings‘. These are negotiations between the European Parliament, the EU Commission, and representatives of Member States. In the forefront European Member States together had to agree on a common Council position. Then the three EU organs entered into the negotiations in order to reach an agreement between the Commission’s business-friendly draft and the human rights-based parliamentary draft. Stop Mad Mining represented by CIR and PowerShift from Germany and AITEC from France will hand over the petition during the second Trialogue meeting on 5th April to political decision-makers. The EU imports 16% of the global supply of tin, tungsten, tantalum and gold , which is linked to the production of technology products. In addition EU companies import these metals indirectly in consumer and industrial products, such as laptops and smartphones. The study of the US-American NGO ‘Enough Project’ proves positive effects of the US law http://www.enoughproject.org/files/DRC_PointofOrigin_022016.pdf.